Patra's Other Place: MIL's 99th birthday. 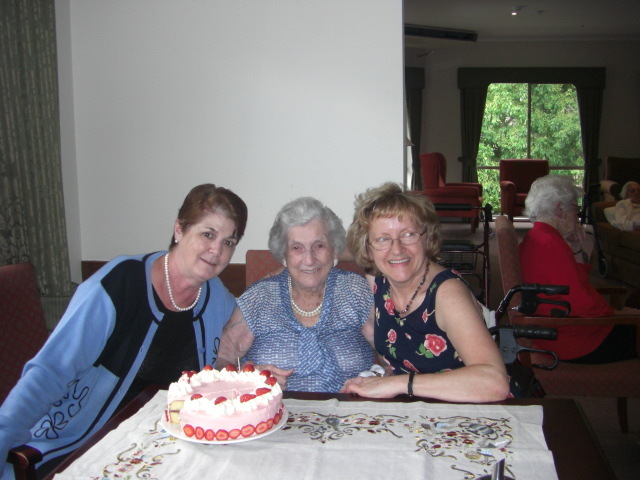 Ken's Mum turned 99 today, and the staff where she lives always give their residents a birthday cake and special afternoon tea for their birthdays. Most of the family are at work during the week, but SIL left work early so she could join me to help Mum celebrate her birthday on 'the day' instead of just being with the other residents and staff. I had found a very pretty embroidered cloth in the opshop this morning, so I took it along to put on our table. Mum loved it, and some of the other residents came over to admire it too. Tomorrow (Saturday) SIL is hosting a birthday party at her place for her Mum, and most of the family will be there, so I'll probably post some more photos afterwards.